Hi everyone! As you can all see, I had my new design go live today! I love it! The more and more I look at it the more and more I just see "me". A huge shoutout goes to Eva Kipler for allowing me to use her design kit. I love pink and orange and I searched for weeks for the perfect kit that I would love and this was the only one I truly fell in love with. Eva so graciously allowed my designer to use this kit and I am very thankful for her allowing us to do so. Secondly, thank you to Lara at Designer Blogs for designing this to my liking. She did a fantastic job and so nicely put up with all my questions and requests. 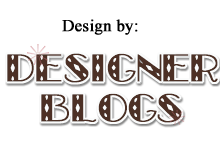 I would highly recommend her to anyone looking for a blog design. Please make sure that you tell them I sent you, they have an awesome referral program. Love the new design Ness! It is very you! !